In the ongoing fight against the magpie peril a person was seen in the early morning quiet streets of Red Rock and Corindi Beach dressed for battle. Apparently it was Edward “zip-tie” Scissorhands. What is it with magpies? As Spring approaches birds such as magpies protect their nesting sites from threat. Yes, riding past a nesting site during this six to eight week period is seen as a threat by magpies. According to NPWS Central Coast Hunter Range Regional Manager, Tom Bagnat, a few simple precautions can help you avoid swooping attacks from nesting magpies. Magpies are less likely to attack people who take a wide berth around nesting trees, so it’s a good idea to keep 30 metres away from known magpie territory, or, if possible keep away altogether. Try and be confident, as this will often encourage them to stay in their trees and observe until you pass by. Consider waving your arm above your head just in case, but don’t swing it at a magpie. Provoking it will only make it more aggressive. 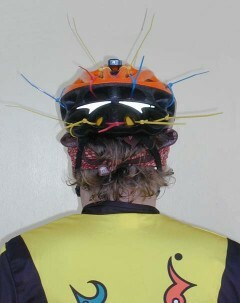 Wearing a helmet on your head can offer protection. You can always try out the modification shown in the photo below. Remember, magpies are a protected species and harming them can attract a fine of $11,000 and/or six months imprisonment.